Happy Monday! Hope it's going well and you've been able to avoid that Monday Blues. If not, don't worry, a sheet mask and a little me-time will make it all better! 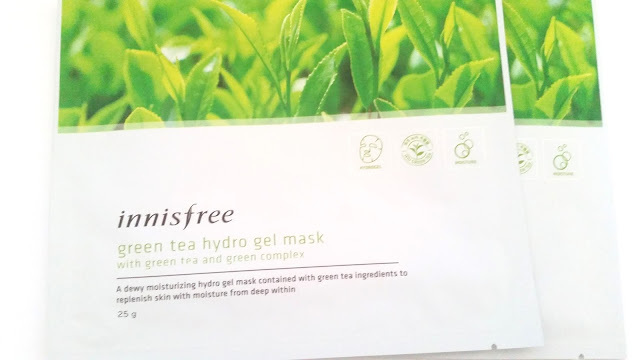 This Mask Monday I will be reviewing the Innisfree Green Tea Hydro Gel Mask. I got all 7 types of Innisfree's hydro gel masks to try during their last sale. I've been wanting to try out different types of hydro gel masks and thought Innisfree would be a safe bet since I like a lot of their skin care products. 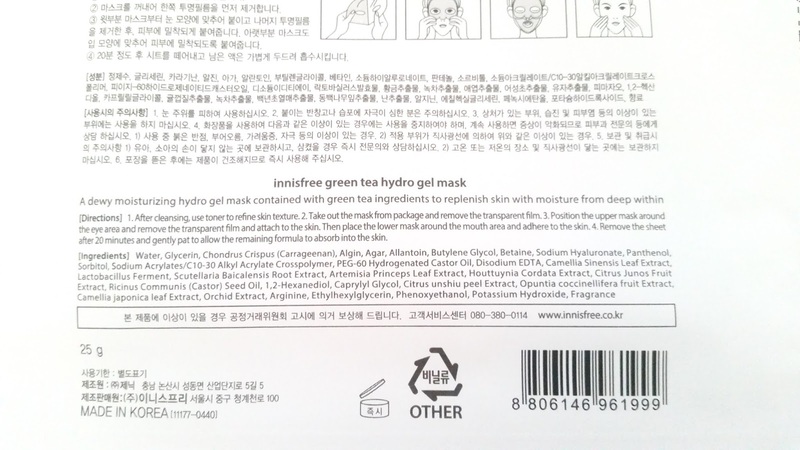 Product description: A hydrating hydrogel mask formulated with organic green tea from the Jeju Island. The mask can help deliver nutrients deep into the skin without leaving any sticky residues. 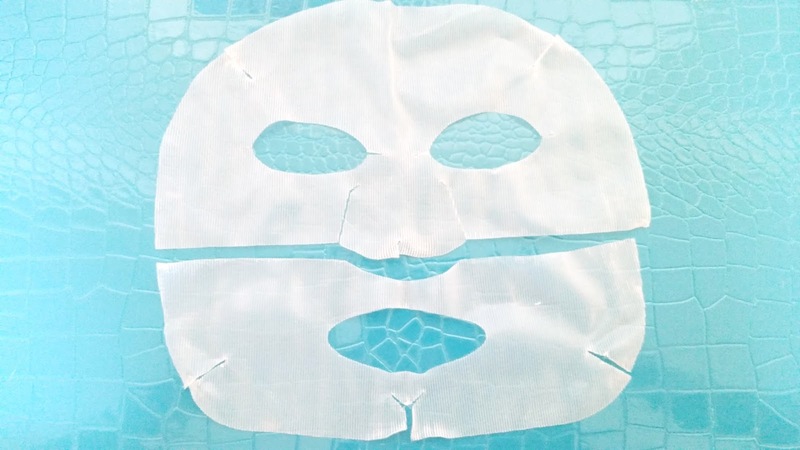 The hydrogel mask provides a cooling effect and can help soothe the skin. The mask comes in 2 pieces, a top section and a bottom section, to adhere better to the skin. To Use: Cleanse and tone the skin first. Remove the mask from its protective layers and apply it onto the face. Remove the mask after 20 minutes and pat in any remaining essence. Expiration date on the side. 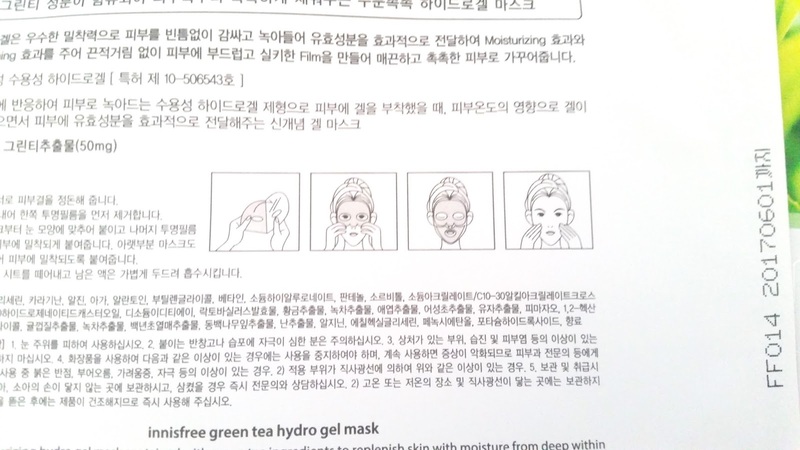 Packaging: Like most Innisfree masks, the package is simple and straight to the point. 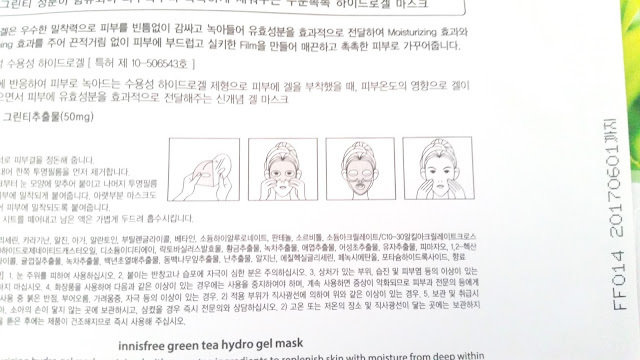 The front of the mask shows a picture of the main ingredient in the mask, the product's name, and a short description of the mask. The back of the mask packaging has product information, instructions, and the ingredient list in both English and Korean. Inside the mask pouch, the hydrogel mask is held up by plastic protective layers, to keep the mask's shape and keep it from sticking to each other. Scent: The Green Tea Hydro Gel mask has a herbal scent with a hint of green tea. Texture: You can easily feel the mesh on one side of the mask when you first take the mask out. It's not too bad just a bit stiff. Due to the mesh material, the mask has a stiff feel overall. The folds of the mask are especially set in, making it difficult to adhere to the face in certain areas. Color: The hydro gel mask is clear in color, although you can see the white mesh clearly as well. My Thoughts: When I first took out the mask, it felt stiff. I was afraid it wouldn't fit well. However, as I placed it on my face, I found that it fit pretty good. The folds of the masks were a bit awkward and it would poke outward because the folds were set in by the stiff mesh making it hard to adhere to the face. However, aside from that, it fit pretty well. The mask did feel like it could slide off of the face for the first 10 minutes. However, once my face heats it up a bit, it stayed without moving. Although I ended up watching TV with only small movements just in case. I decided to try the Green Tea Hydro Gel mask first since I needed a soothing and moisturizing mask that day. The mask was moisturizing and it felt cooling on my face. It was able to help reduce some redness too. The hydro gel mask was very soothing and it even brightened my face a little. Although the instructions says to leave it on for 20 minutes, I left it on for around 35 minutes. The hydro gel was thinner by the 35 minutes mark but still there so it's not just the mesh sitting on my face. I have since used this mask 3 times and found that I can leave the mask on my face for up to 50 minutes. I felt the mesh on my face when I try to leave it for over 50 some minutes. So, I'd say 50 minutes max to be safe. Mask selfie time! As you can see the mask did fit pretty well on my face. The mask did have a bit of a tingly feeling when it was on my face. It didn't cause any negative effects, although I couldn't figure out what caused the tingly feeling either. 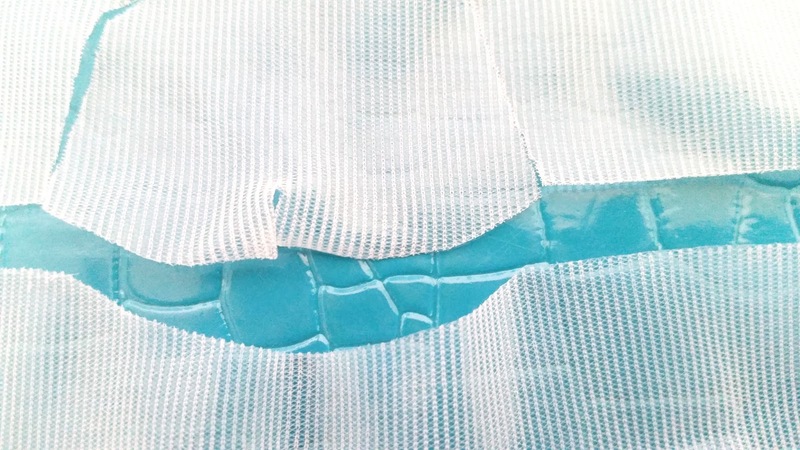 The hydro gel mask is also on the thin side and the mesh is on the thick side. I wish it was the other way around. While the mask was hydrating when it was on my face, once I took it off, the hydrating feeling ended too. Which was a bit odd since most masks leaves a hydrating feeling on my face even after I remove it. The mesh after the hydro gel dried. Close up of the mesh. Final Thoughts: My first Innisfree hydro gel mask and I was slightly disappointed. The mask was able to help reduce redness on my skin, which was wonderful. It also provided a soothing feeling on my skin which I enjoyed. Plus it felt very moisturizing when the mask was on my face. However, that moisturizing feeling disappeared once I removed the mask. Seems like that the moisturizing effect does not last long. The hydro gel mask had a thick mesh that felt stiff and made the fit awkward on certain areas of the face. The most noticeable downside of the mask was its tingly feelings. Although it didn't cause any negative effects, it still wasn't all that pleasant. Would I repurchase this mask? Probably not. I think I can find better hydro gel masks on the market. 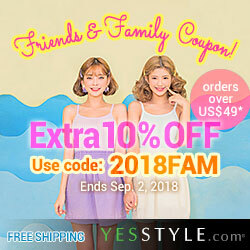 Would I recommend this mask? Well, if you are looking for something soothing and can help reduce redness, this is a good one. I'm not sure if the tingly feeling is just on my skin, since I do have sensitive skin. If you don't have sensitive skin, it might not cause that feeling. If you do have sensitive, do be careful with this mask. 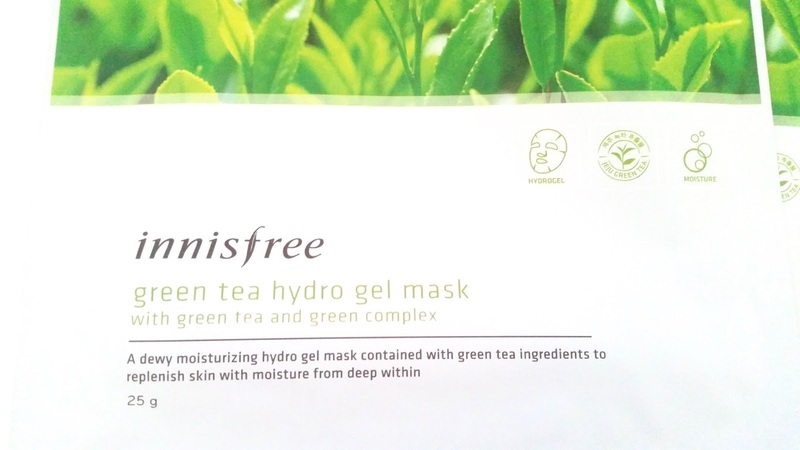 Have you tried Innisfree's Green Tea Hydrogel Masks before? What are your thoughts on them? Leave a comment below and let me know! Hello, may I know how to apply this mask? Because this is the first time I try to use a hydro gel mask. Is the transparent like plastic side apply on the face or the side with the white mesh should be applied on the face? Hi there~ The Innisfree Hydrogel mask comes with clear plastic protective coverings. After you remove those from the top and bottom parts, you may apply the mask. Personally, I like to apply the side that's more hydrogel than mesh on my skin. That way, you minimize the chance of the mesh leaving imprints on your face. 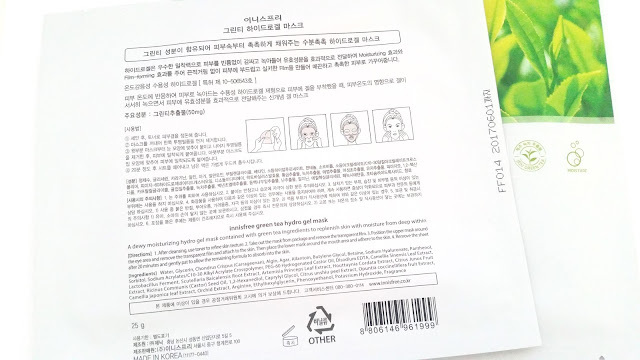 However, on the mask's packaging, it doesn't mention a right or wrong side to wearing the mask. So I think it would be okay either way.